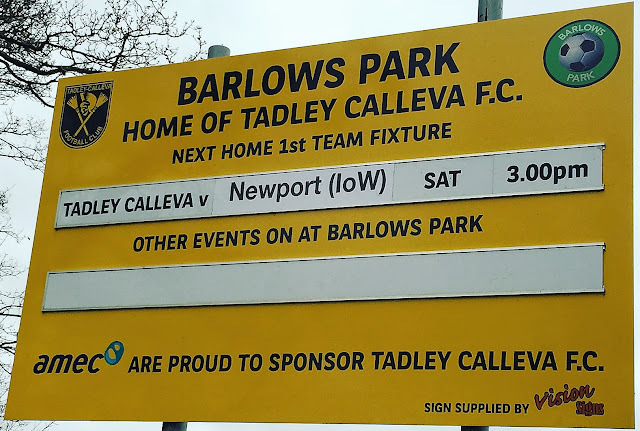 The club was formed in 1989 and played in local leagues, mostly the Hampshire League for much of their early history, going under the names of Tadley and Tadley Town. The present name was adopted in 2004 and the Calleva suffix comes from the nearby town of Calleva Atrebatum, better known nowadays as Silchester. Joining the Wessex League in the third tier that same year, they won promotion in 2007 after finishing runners-up to Fleetlands and were promoted to Division 1. They had a great first season finishing as champions but were denied promotion due to ground grading issues. 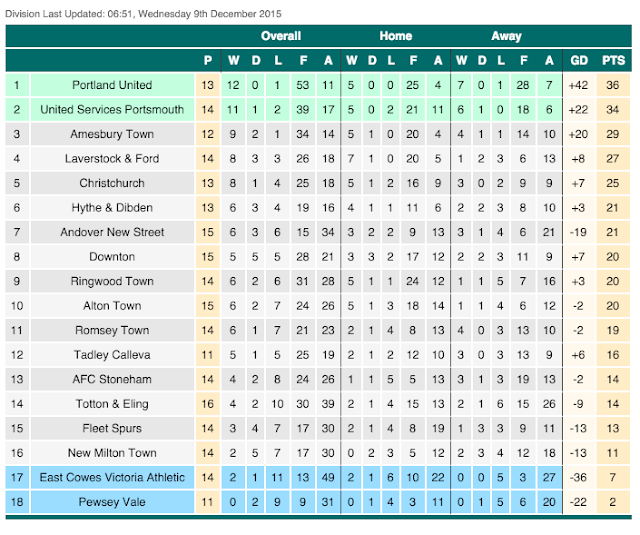 They remain in Division One to this day with a subsequent best finish of 3rd which came last season. They'd dropped a fair bit this season, sitting in 12th at the start of play, but did at least have a few games in hand on most teams. 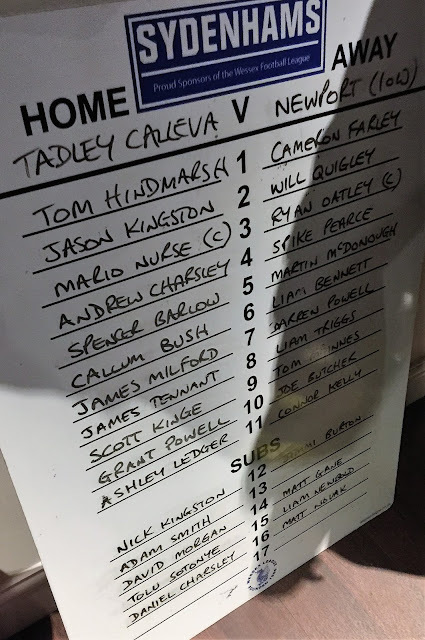 Tadley Calleva's sole cup win came in 2014 when they beat AFC Aldermaston to lift the Basingstoke Senior Cup at Basingstoke' Town's Camrose ground. The club has been entering the FA Cup since 2013/14 and has yet to win a game in the competition. They did advance to the Preliminary Round in their first season, despite losing 4-2 to Ascot United as their opponents fielded an ineligible player. Even then they went out to Chalfont St Peter, albeit with a credible 5-3 defeat to a side two leagues above them. The FA Vase has been a similar tale of woe with their sole victory prior to this season coming last time out when they beat Alton Town before going out to Hook Norton Town in the 2nd Qualifying Round. This season has seen record progress with the team putting a marker down with the 6-0 demolition of Woodley Town in the 1st Qualifying Round. This was followed by an impressive victory at Combined Counties Premier outfit Chertsey Town where they ran out 2-0 winners before another giant-killing in the 1st Round proper away at Littlehampton Town. A 4-0 victory over Haywards Heath Town set up today's tie. It would be another tough one with opponents Newport IOW sitting in 9th place in the Wessex Premier, and being seasoned entrants, having reached the 5th Round on a number of occasions. Wycombe Wanderers were playing up at Accrington Stanley this Saturday and as I didn’t fancy it, I knew I’d be doing a groundhop of some sort. Initially, I was hoping that fellow hopper Anwar would be joining me, seeing as he had no plans to go to Accrington. He was unavailable however due to doing something with his kids so I'd have free choice of where to go. I preferably wanted to see an FA Vase game and was pleased when I saw Tadley Calleva v Newport IOW was 37 miles from me, by far the nearest option. I did have some backups in place in case of the weather affecting things. I'd also be able to save a bit before eating at home before I left, what with it being an hour away. On the day of the game, I woke up at pretty much my normal time for work, not great when I was targeting a lie in and couldn’t get back to sleep. I had to wait until 9am to confirm that the game was on but it got the go-ahead after a precautionary pitch inspection. I spent the rest of the morning checking out some facts for today’s blog, but really I was willing 1PM to hurry up so I could start making the journey over to Hampshire. After a ham roll for lunch, I set off pretty much on time, arriving at 1.55. On the way, I'd been listening to TalkSPORT and several matches were biting the dust up north. Sadly for my Wycombe mates who had made their way up to Accrington, that match was included as the referee deemed the pitch unplayable. I was a bit concerned when I parked up and saw a game already going on as I'd heard nothing about any odd kick off time. But it turned out to be the second pitch hosting another game. After I'd picked up a programme I went into the bar to kill some time before kick off. I was very impressed with the setup - they had Norwich City v Everton and Franchise v Ipswich Town both on TV. Best of all they had a great cider- Cornish Orchards Gold, one which I am sure I have had before but it counted as a tick in my Untappd app. That was delicious and the warm and cosy bar soon filled up with fans that had come to watch today's game. Around 2.30 I went out and braved the chill, paying £5 to get in. Before the game, I got myself up to date on Facebook and got some pictures of the ground. The game was pretty decent, with some nice passing football being played. However, defences were solid and the few mistakes that were made were not capitalised on. The visitors took the lead on 38 minutes with a scrappy close-range finish after Tadley failed to clear their lines properly. 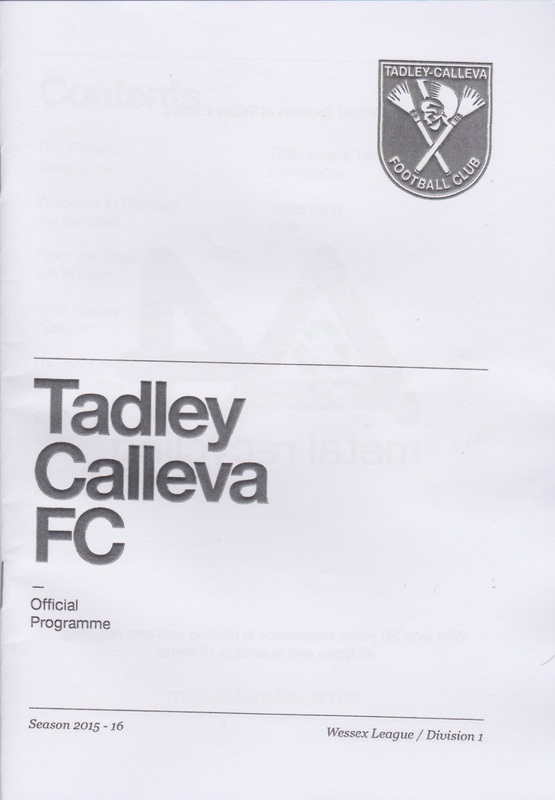 Both sides had spells of dominance and on 70 minutes Tadley got a deserved equaliser. James Tennant's free-kick was a decent one but the Newport keeper might have felt he could have done better, even though the wall was blocking his view of the kick coming in. Around 15 minutes from time, the hosts were ahead. It was another piece of suspect keeping from the Newport custodian as he allowed a tame shot over the line. The officials were on hand to award the goal, much to the delight of the home crowd. It was another close-range finish that bought the visitors equaliser five minutes from time when a chance was converted from a decent ball in. They had a late chance to win it when a free kick thundered against the crossbar though the resulting scramble would have been ruled out for offside had it gone in. Newport had much the better of extra time but it yielded no further goals. So, it will go to a replay on Tuesday over in the Isle Of Wight. It had been a cracking game and I'd like to have seen it to it's conclusion, with penalty kicks if needed. 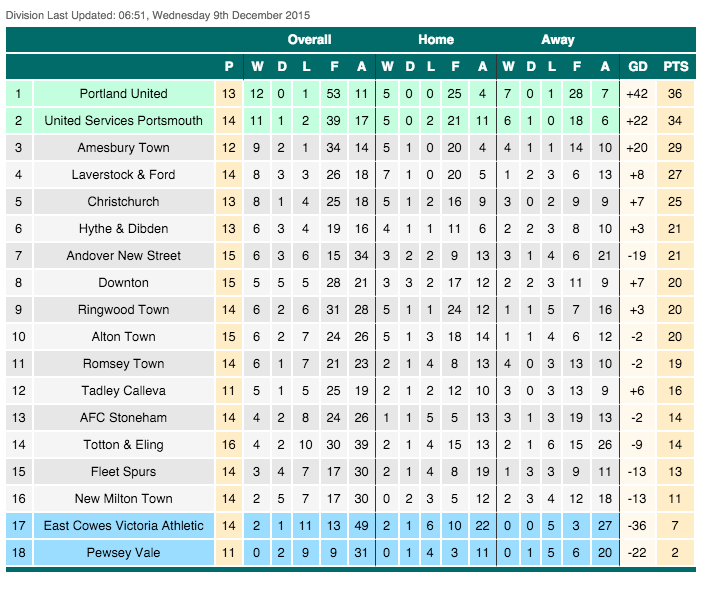 Tadley just about shaded it in my eyes, and added another scalp to their list this season. Though I'll be at Wycombe Wanderers v Notts County I'll be keeping an eye on the result of the replay. Leaving at 5.35 I got home 50 minutes later. I had a Chicken Jalfrezi for dinner before giving my parents a lift to a Christmas bash. I spent the rest of the evening chilling, watching Match Of The Day before going to sleep around midnight. BARLOWS PARK is a neat and tidy venue with hard standing all around. 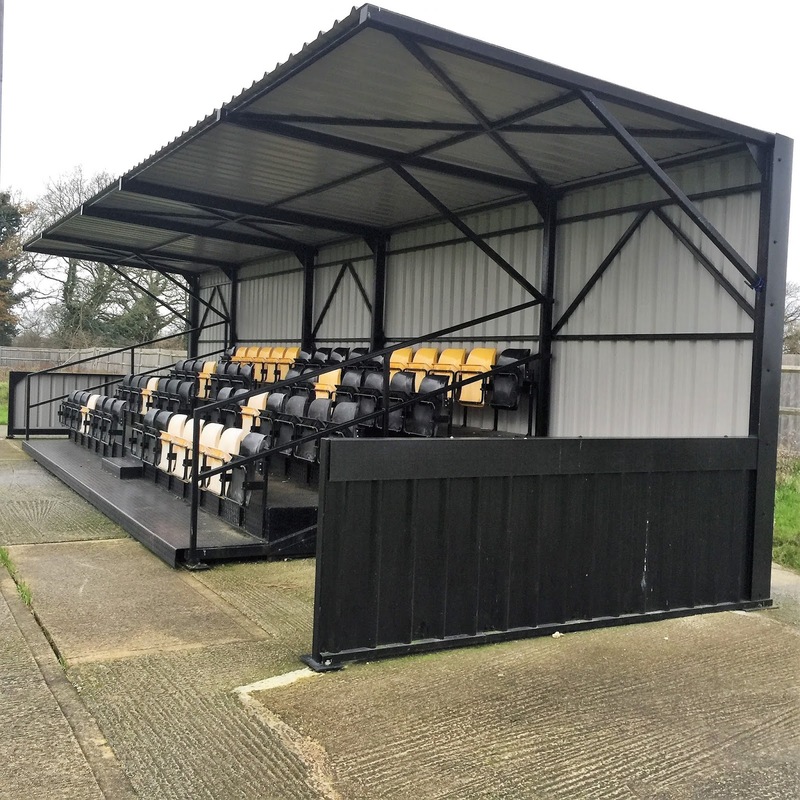 The only cover is a 50 seater metal stand with the clubs initials picked out in yellow on the black seats. Food is restricted to pies and pasties from what I could see. Pin badges are available also but the real star of the show was the bar. 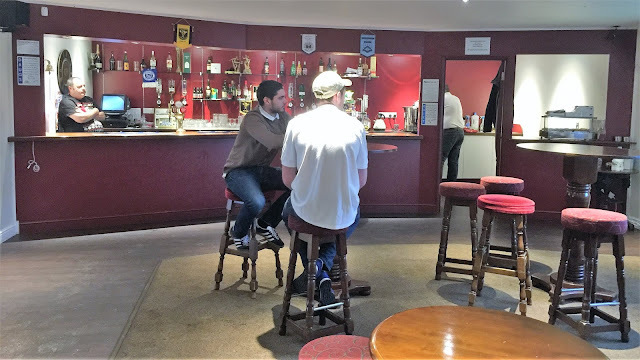 With a great range of real ales and ciders, at least for a non-league bar, there's no need to walk the 5-10 minutes to the local pub as they also show all the matches from Sky & BT Sport.